After 20 plus years of learning about and searching for Craftsman Homes, the author felt pretty sure he had the topic mastered! Imagine the surprise when he was examining a Gustav Stickley promotional brochure Chips from the Craftsman Workshops No. 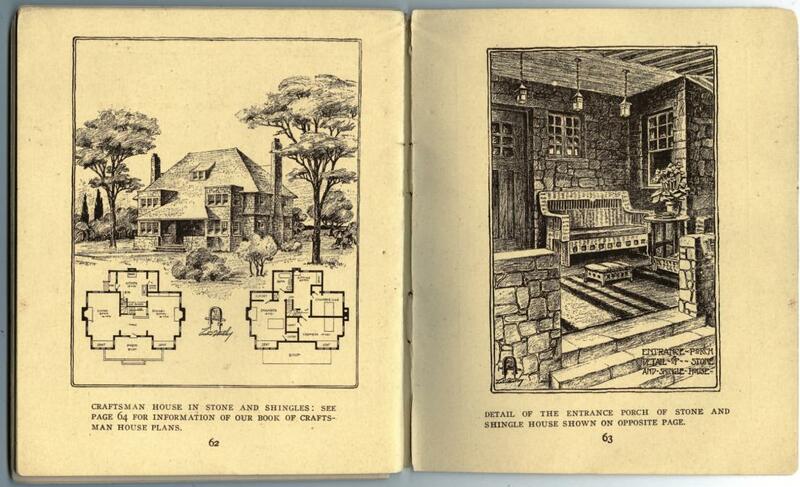 11, dated at about 1906-7—based on the furniture samples shown along with the home—and on the last few pages (above) there was a Craftsman House—not numbered or dated—that the author had never seen before! The house appears to be from the same period as the Craftsman Home No. 40, which also features two square towers. It was not published in The Craftsman and the plans are not in the incomplete collection at Columbia University’s Avery Architectural Library. So was it a reject Craftsman Home? Intended for publication, but never published in the magazine for unknown reasons? It is an awkward house—at least in the drawing. The large, sweeping hip roof has an out-of-proportion shed-roof dormer in the front, and while the porch roof mimics the main one, it appears to accent the awkwardness of the roof in relationship to the square towers. Not one of Gus’ most successful exterior designs. So how do we number it? No. 40A? All that is shown about the house is on these two pages. Above is an overview of the home and just above is a detail showing the front porch. The roof appears the be the “shingle” of the Stone and Shingle House, as both stories appear to be clad in cut stone. The plans enlarged at left show that the first floor is laid out as a horizontal center hall with a kitchen placed in the rear (left) and three bedrooms and a bath comprise the second floor (right).